The kingdom knows their princess as Snow White, but the Queen Francesia, her stepmother, sees her for what she truly is, a monster. None other than the queen can see beyond the illusion of beauty. None see that she appears to be bone and ashes. No one else realizes that the child drinks blood and even kills. As the child grows, so does her thirst. Francesia knows she must stop Bone Ash, lest the princess devastate the entire realm. One will be the harbinger of the other’s death, but who will survive? 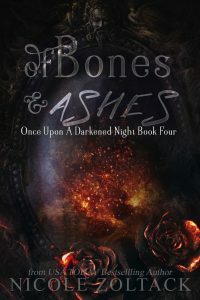 Of Bones and Ashes also includes the short stories The Cost of Treachery and The Cost of Enchantment as well as an alternative ending.